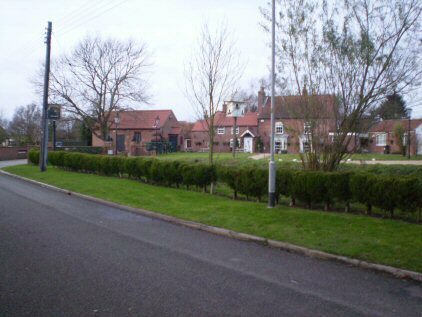 Fourteen miles due east of the City of Lincoln and five miles north west of the market town of Horncastle lies the scattered village of Minting. Mentioned in the Domesday Book, its current population is 243 (2001 Census) from a maximum of 415 circa 1860. At the centre of the village, around a very small Green, is the church, the Sebastopol Inn and earthworks of an alien Benedictine priory founded around 1129. 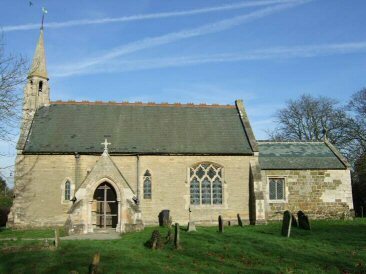 Photo: Roy Griffiths The church, a Grade 2* listed building dedicated to St. Andrew has Saxon remains with additions in the 15th century but mostly it comprises an 1863 rebuild. At this time the nave walls, aisle walls, arcade, chancel and porch were taken down to ground level and rebuilt to a plan produced by Ewan Christian. At the same time a new oak floor was installed along with deal pews, an oak pulpit and an oak main door. The roof is green slate with stone coped gables, crosses fleury and decorative tiled ridges with a bellcote. Built into the east wall of the nave, to either side of the chancel, are fragments of an elaborately carved c1200 cross. In assessing whether a village would qualify as a Thankful Village or not, there has usually been a starting point to the investigation in the form of a Roll of Honour or of Service, or a War Memorial, or a stained glass window in the parish church. For Minting there was none of these. However, the local newspaper, The Horncastle News, published in each issue "Our Roll of Honour" which listed each soldier or sailor as he laid down his life. These were recorded under the name of the community from which the man came: Horncastle or one of the surrounding villages. This Roll of Honour was cumulative. i.e. after a name appeared in the Roll, it was carried forward under the village heading from week to week, remaining until the last listing. 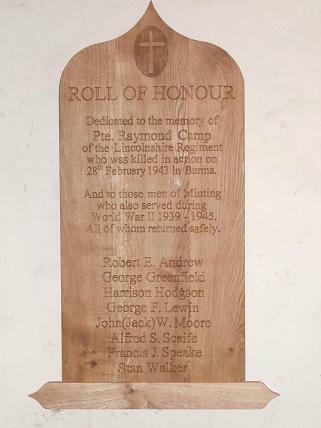 The last weekly Roll of Honour was published on Saturday 11 January 1919. The last list of killed, missing, wounded, appeared on the 3rd of September 1919. In the Roll of Honour, and the last list, only those towns and villages which had casualties were named. The name of Minting is not included, though villages adjacent to Minting are mentioned e.g. Baumber (5 died); Gautby (1 died). From this, it would appear that Minting would be worth further investigation. The 1918 Register of Electors for Minting includes these nine Naval and Military Voters, and following is the entry in the 1901 Census for those who were living in Minting in 1901. It would have been possible for the soldier to have died between the compiling of the Register and the end of the war in November. So the Register of Electors for May 1919, May 1920, and Autumn 1920 were examined, and gave the following relevant results. So it is evident from the above voters lists that there were men from Minting serving in the Great War and that all the men listed came home again. The first two to be demobbed were Harry Balding and Alexander Miller. 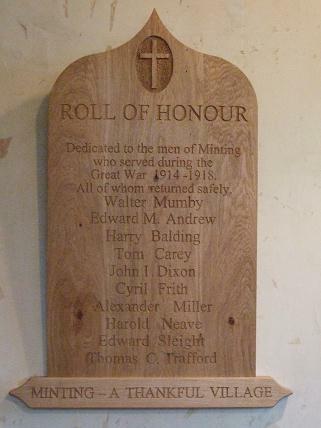 The above 10 names could be regarded as the Roll of Honour for Minting. Our Conclusion is that Minting is a Thankful Village. The Sebastopol Inn - the village pub and a 17th Century coaching-inn. 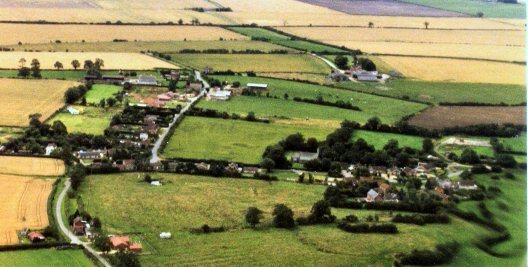 We owe our very sincere thanks to Roy and Karen Griffiths of Minting for drawing this village to our attention and for the thorough and painstaking way they have searched the newspaper files and the Lincolnshire Archives on our behalf. In November 2008, the community of Minting placed the plaque shown on the left in the Parish Church of St Andrew. It records the names of the ten men from the village who served their country in the Great War, and who returned safely home. In November 2009, a similar plaque, shown on the right, was placed near the one for the Great War to record the names of the men of Minting who served in the Second World War. Unfortunately one of these men did not return,and this later Roll of Honour is particularly dedicated to his memory.